*1: The system judges a person of adult size as an adult. When a smaller adult sits in the front passenger seat, the system may not recognize him/ her as an adult depending on his/her physique and posture. *2: In the event the front passenger is wearing a seat belt. *3: In the event the front passenger does not wear a seat belt. *4: For some children, child in seat, child in booster seat or child in convertible seat, the system may not recognize him/her as a child. Factors which may affect this can be the physique or posture. *5: Never install a rear-facing child restraint system on the front passenger seat. A forward-facing child restraint system should only be installed on the front passenger seat when it is unavoidable. *6: In case the indicator light is not illuminated, consult this manual on how to install the child restraint system properly. Observe the following precautions regarding the front passenger occupant classification system. Wear the seat belt properly. Make sure the front passenger's seat belt plate has not been left inserted into the buckle before someone sits in the front passenger seat. Make sure the "air bag off" indicator light is not illuminated when using the seat belt extender for the front passenger seat. 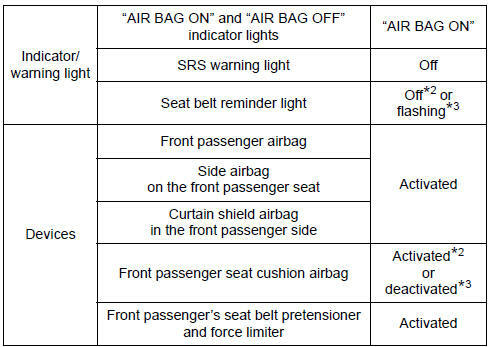 If the "air bag off" indicator light is illuminated, disconnect the extender tongue from the seat belt buckle, and reconnect the seat belt. Reconnect the seat belt extender after making sure the "air bag on" indicator light is illuminated. 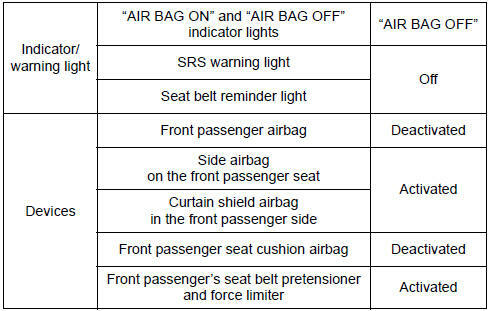 If you use the seat belt extender while the "air bag off" indicator light is illuminated, the srs airbags for the front passenger will not activate, which could cause death or serious injury in the event of a collision. Do not apply a heavy load to the front passenger seat or equipment (e.G. Do not put weight on the front passenger seat by putting your hands or feet on the front passenger seat seatback from the rear passenger seat. Do not let a rear passenger lift the front passenger seat with their feet or press on the seatback with their legs. Do not put objects under the front passenger seat. do not recline the front passenger seatback so far that it touches a rear seat. 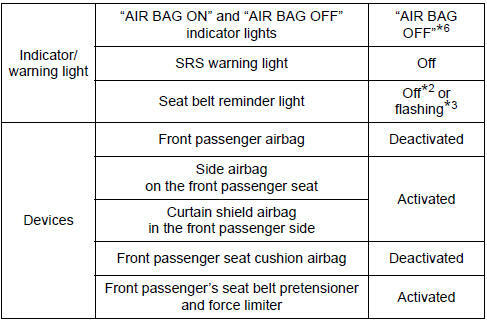 This may cause the "air bag off"¸ indicator light to be illuminated, which indicates that the srs airbags for the front passenger will not activate in the event of a severe accident. If the seatback touches the rear seat, return the seatback to a position where it does not touch the rear seat. Keep the front passenger seatback as upright as possible when the vehicle is moving. Reclining the seatback excessively may lessen the effectiveness of the seat belt system. 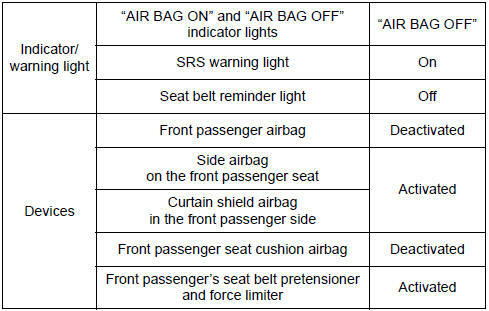 If an adult sits in the front passenger seat, the "air bag on"¸ indicator light is illuminated. 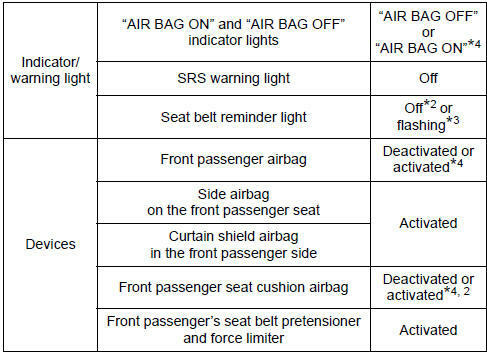 If the "air bag off"¸ indicator is illuminated, ask the passenger to sit up straight, well back in the seat, feet on the floor, and with the seat belt worn correctly. 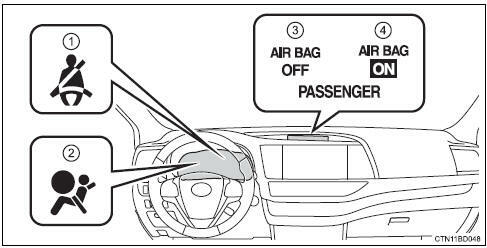 If the "air bag off"¸ indicator still remains illuminated, either ask the passenger to move to the rear seat, or if that is not possible, move the front passenger seat fully rearward. When it is unavoidable to install a forward-facing child restraint system on the front passenger seat, install the child restraint system on the front passenger seat in the proper order. Do not modify or remove the front seats. Do not kick the front passenger seat or subject it to severe impact. Otherwise, the srs warning light may come on to indicate a malfunction of the front passenger occupant classification system. In this case, contact your toyota dealer immediately. Child restraint systems installed on the rear seat should not contact the front seatbacks. Do not use a seat accessory, such as a cushion and seat cover, that covers the seat cushion surface. Do not modify or replace the upholstery of the front seat.